Monymusk is off the B993 between Kemnay and Alford, approximately 20 miles WNW from Aberdeen. The village hall is between the play park and the Church. Entries will be taken on the day. The entry fee is £5.00 with an additional levy of £2.00 for those who are not individual members of scottishathletics. The race will have a permit from scottishathletics and will be held under UK Athletics rules. 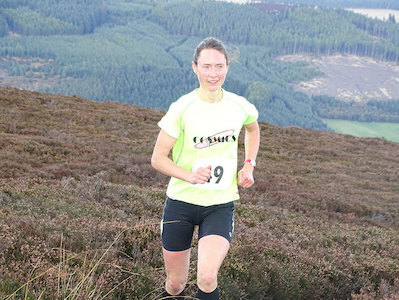 The course starts and finishes in Monymusk visiting the summits of Pitfichie Hill (379m) and Cairn William (448m). It includes a mixture of roads, tracks, paths and terrain. The marked route must be followed. The current course is about three and a half minutes longer than the route used from 1995 to 2003 and one and a half minutes longer than that used up to 1994. There will be Junior Races on Pitfichie Hill starting and finishing where the senior race leaves the road, approximately 1.5km from the main start. Older juniors will visit the summit whilst U12 competitors will turn after 1km where the summit path leaves the forest road. The entry fee for the junior races will be £2.00 for all contestants.